complete with an overhead track and movable trolley, allows the patient the freedom to ambulate, perform functional types of activities, and fall with minimal risk of injury while secured in a simple body harness. Boosts Confidence – Reduces the fear of falling, allowing you to take the next step. Natural Range of Motion – Allows for natural movement and does not require the use of the upper body, unlike parallel bars. Ultimate Safety – Provides a safe atmosphere for balance and gait training. Makes falls a thing of the past. Advanced Therapy = Faster Healing – You will be able to rehabilitate quicker and return to full-strength in less-than average time. User Friendly = Happy Patients – The safety harness can easily be put on from a standing or sitting position. Fight the fall with a fall risk assessment. 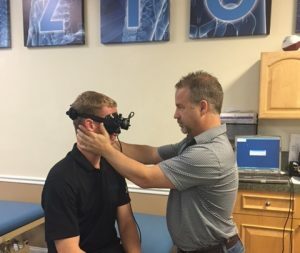 Learn more about how FYZICAL® specializes in helping patients who need vestibular rehabilitation, or those who suffer from dizziness or balance disorders. Our professional physical therapists can help bring balance back to your life through our balance retraining and state-of-the-art technology. 1. Have you fallen more than once in the past year? 2. Do you feel dizzy or unsteady if you make sudden changes, such as bending down or turning quickly? 3. 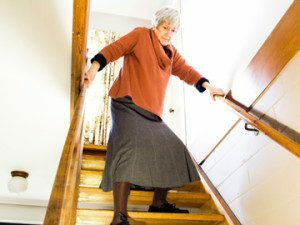 Do you feel unsteady when you are walking, climbing stairs, or stepping up or down a curb? 4. Do you feel unsteady walking on uneven surfaces such as grass, gravel, or sand? 5. Do you have difficulty sitting down or getting up from a seated or lying position? 6. Have you had a stroke or another neurological problem that has affected your balance? 7. Do you have numbness or loss of sensation in your legs and/or feet? 8. Do you use a walker or wheel chair, or do you need assistance to get around? 10. Do you take medication for two or more of the following: heart disease, hypertension, arthritis, anxiety, or depression? If you answered yes to any of these questions, give us a call to set up a free fall risk assessment with one of our professionals to determine your fall risk. FYZICAL® uses advanced medical techniques to overcome dizziness and vertigo. Vestibular rehabilitation is an exercise-based program designed by a specialized physical therapist to improve balance and reduce dizziness-related problems. 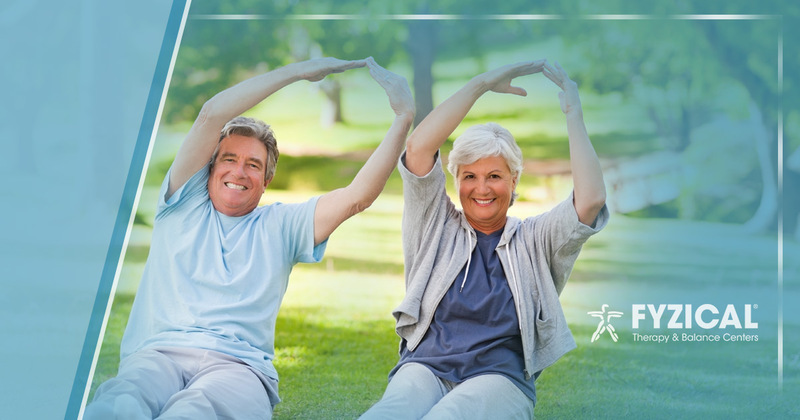 When you meet with one of our professional physical therapists, a treatment plan will be developed that will improve your ability to function in everyday activities, reduce your risk for falling, and ultimately improve your quality of life. VERTIGO– Feeling a spinning or whirling sensation. DISEQUILIBRIUM– Feeling as though you are tilting, swaying, off-balance, or unsteady. LIGHTHEADEDNESS/WOOZINESS– Feeling like you may pass out. Feeling confused. MOTION SICKNESS– Feeling queasiness or sick to your stomach. BEHAVIORAL– Feeling anxious or panicked.